Probably the first insect of the season to show up on your Rhodos will be the Black Vine Weevil…so-called because grape vines are among the various plants on which it’s found. 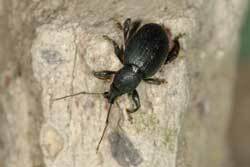 The adult is a small, 3/8″, black beetle that emerges in late spring. They feed at night, chewing on the edges of the leaves and dropping to hide in the litter below during the day. You want to distinguish between damage that occurred last year and that caused by the current generation. If you’re into nocturnal adventure, in late May start scouting for them with a flashlight after dark. Look for those notches particularly, on the lower leaves. Or, you could lay sheets of cardboard beneath the shrubs and check under the sheets for the beetles’ presence during the day. Unfortunately the vine weevil larva, small white grubs with brown heads, will soon be feeding on the plants’ roots, limiting their ability to take up moisture or nutrients. 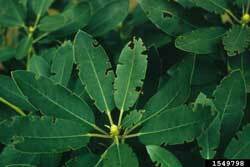 Your rhodos may be getting a double whammy and that would show up as chlorotic, yellowing, leaves. If you do identify the black vine beetle as the culprit, Beauveria bassiana, a naturally-occurring fungus that causes a disease in the insect, is registered for its control. Read the label to see how to apply. 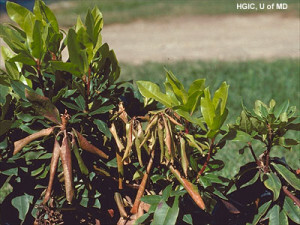 The presence of the Rhododendron borer will be signaled by the wilting, curling and eventual dying of the leaves, so by that time you see it, it’s too late to mount an effective attack. The objective is to catch the culprit before they can do significant damage and that means checking below the branches looking for frass or sawdust expelled by the insect as it bores his, or hers, entry hole. The frass signals that the Borer is inside the stem above that point working its way downward. Identify the branch by locating the small, quarter-inch entry hole. Now how far down has the critter gotten? We can determine by cutting off successively lower parts of that branch until we find a section with no hole bored in the center. The borer hasn’t gotten that far so now remove all of that branch down to where it joins the next stem. Make a clean cut so that it will heal quickly. Dispose of the pieces removed. Bury them, trash them, somehow get them out of the garden.